Fluffy and I just returned from a few days in Virginia Beach, a quiet little town that is (as its name implies) on the ocean. On Sunday we took a trip up the boardwalk, braving the bitter cold to see the sights. 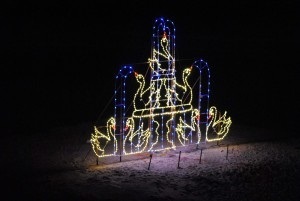 During the day, the lights weren’t on and the displays were far from impressive. But at the end of our trip we stumbled across a monument we had not seen before. This larger-than-life bronze sculpture contained three figures — a white male, a black male, and a female. As we approached the sculpture we learned that this was a memorial to Virginia Beach’s fallen law enforcement officials. 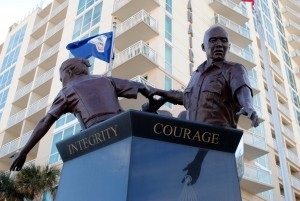 Two of the three law enforcement figures in the Virginia Beach memorial. There was a series of pillars surrounding the sculpture, and as we got close we saw that the pillars contained memorials to individuals who had lost their lives keeping Virginia Beach safe. The first one I read was dedicated to a man who had been deputized to arrest a man who had stolen a firearm. Within hours of being deputized, he tried to arrest the thief and got shot in the neck and the head for his efforts. I wondered what kind of sheriff would deputize a man off the street to do, well, a sheriff’s work. Then I reread the text and saw that this event had occurred in 1898. That explained things. People got deputized more often back then than they do today. At least, I suppose this was the case because I’ve never heard of this happening in my lifetime, but it apparently happened at least once back then. I went to the next pillar and read the second fallen officer’s story. He had died in 2006 — not from an act of violence, but from a heart attack suffered when he was doing a training exercise. In this case, it appeared that the man’s number was up, and he just happened to be at work when it happened. I went to the next pillar to read the next story, but there wasn’t a story on that pillar. There wasn’t a story on the next pillar, or the next one, or the one after that. By the time I got all away around the sculpture, I realized that in the history of Virginia Beach, only two law enforcement officers had lost their lives on the job. The fatalities were 108 years apart, and they involved a man who really wasn’t a law enforcement officer and a man who was a law enforcement officer but who wasn’t enforcing the law at the time. My first impression at looking at this big memorial to two events that were so far apart was one of amusement. The people who put up the memorial were obviously planning ahead when they included a black officer and a female in the memorial, because neither of the fatalities so far was female or black. But then I understood it. The whole issue comes down to the meaning of “sacrifice.” You don’t actually have to give something up in order to sacrifice it; you just need to be willing to do so. Two Biblical instances stand out. The first was Abraham’s sacrifice of his son Isaac on the altar, back in the Old Testament. Abraham built the altar; he gathered the wood to burn the offering after he slew it; he trussed up his son and laid him on the altar. Then he raised his sword to slay Isaac. As it turned out, God didn’t need Abraham to actually kill Isaac. The only thing God needed was to know that Abraham was willing to do it. Once Abraham had proven, however mournfully, that he would do as God commanded, God provided the “lamb in the thicket” to take Isaac’s place on the altar. The second sacrifice was the sacrifice that Jesus made to atone for our sins. Most of Christendom believes that the sacrifice was made on the cross. We who are Latter-day Saints understand that the actual sacrifice was made on Mount Gethsemane, when Christ sacrificed His will to that of the Father and bled from every pore (Luke 22:39-44). The actual crucifixion only sealed the sacrifice that had already been made. When I remembered those two scriptural examples, I realized it hasn’t just been two men separated by more than a century who have sacrificed themselves for the welfare of Virginia Beach — and for the welfare of every town and city and rural area across the land. Every law enforcement officer and every firefighter who has been willing to go into a burning building or pull over a car that may contain a felon with a gun has already made that sacrifice. Every member of the military who puts on a uniform, not knowing whether he will live to take off that uniform at the end of the day, has made that sacrifice too. This may be a little late for Veterans Day, but today I’m thankful for the people who have sacrificed their lives to keep me safe, both at home and abroad. I’m grateful for the ones who actually were killed in the line of duty, but I’m equally grateful for the men and women who were willing to be killed, if that is what it took, to keep the rest of us safe.